Home › New Hotels › What’s New in Las Vegas in 2019? In a city that is constantly reinventing itself, it’s hard to keep up with the ever-changing excitement that is Las Vegas! World-renowned food, entertainment, and nightlife make this sparkling jewel of the desert an international vacation destination. We’ll keep you up to date with all of the latest things you will be able to do in Las Vegas through 2019. The newest party spot in Vegas will open its doors in April as part of the Palms’ ongoing $690 million makeover. KAOS is a multi-level nightclub and dayclub that’s already getting attention for confirmed residencies by Cardi B, Skrillex, G-Eazy, Kaskade and Above & Beyond. No expense is being spared. The 29,000-square-foot nightclub will take full advantage of the latest technology, from elaborate lighting and video components to a space-filling sound system. The 73,000-square-foot outdoor deck will make an impression as well. It includes two main pools — with a 65-foot-tall bronze sculpture from Damien Hirst rising from one of them. When counting additional smaller pools and the personal dipping pools that accompany most of the 39 luxury cabanas, the Palms will have more pools than any resort in North America. The venue will continue to make its presence felt with an LED video wall that covers the exterior of the Ivory Tower and offers a glimpse of the action in the club. Another pop diva is coming to Las Vegas. Christina Aguilera will debut a new residency called “The Xperience” at the Zappos Theater inside Planet Hollywood on May 31. Additional dates are scheduled through June, September and October. The singer of hits like “Beautiful” and “Genie in a Bottle” has kept a relatively low profile in recent years. Her 2018 tour was the singer’s first in more than a decade and included a stop at the Colosseum at Caesars, which no doubt was something a test-run for a residency. (Both venues are under the Caesars Entertainment umbrella.) The shows will help fill the void of Britney Spears’ cancelled residency at rival Park Theater, which was scheduled to run throughout the year. The Wynn is scaling back on its plans for Paradise Park. Originally, the project was going to feature a new hotel tower, convention center and numerous other attractions with a 38-acre lagoon at the center of it all. Those plans have now been scaled back. The lagoon is nixed and the golf course that closed to make room for it will now reopen. The designer of the course, Tom Fazio, is being brought in to help renovate the holes disrupted by the construction. It will be back in action before the convention center opens in 12 to 18 months. The Las Vegas edition of Eataly will open at the Park MGM on December 27. The restaurant-retail hybrid dedicated to the art of Italian cuisine will span 40,000 square feet and have a main entrance directly on the Strip. Expect a few in-house restaurant concepts, live cooking demonstrations and al fresco patio seating that’s perfect for people watching. Executive Chef Nicole Brisson, formerly of Carnevino, is in charge — a strong sign that authenticity, ingredients and preparation will be taken seriously. Robbie Williams is giving fans a rare chance to see him perform in an intimate setting with a new residency at the Wynn. He may not be a familiar name to most Americans, but the British singer is a huge star in Europe. Like Matt Goss, but on a much larger scale, Williams is expected to draw a loyal following of British and international visitors to, proving that Las Vegas is truly a melting pot for entertainment. His initial run of six dates in March quickly sold out, prompting the release of six more dates in June. Described as a “journey of transformation,” Kind Heaven will open at The LINQ promenade in November 2019. Guests take a virtual train ride to an immersive environment of sights, sounds, scents, and tastes inspired by the culture of Southeast Asia. Put your cash aside. Wristbands with Yala Coin cryptocurrency will be used to pay for goods and services, including street food inspired by Singapore, Thailand and Hong Kong. At The Dispensary, cocktails crafted with spirits and herbs are designed to match the feelings and emotions of customers. The second floor, dubbed The Forest, is a lush environment of trees and temples. The third level is The Sanctuary, inspired by the beauty and spirituality of Nepal and Bhutan. An intimate concert hall will feature rock, hip-hop, reggae, jazz, pop, EDM and rap by Asian performers. The 100,000-square-foot multistory attraction takes full advantage of Hollywood-style film and holographic special effects. The $100 million project is the brainchild of Jane’s Addiction frontman and Lollapalooza founder Perry Farrell. The Park MGM is already officially open, but there are still plenty of upcoming attractions in the works for the stylish Strip resort. A new nightlife concept, On the Record, is an 11,000 square-foot lounge with three different rooms and a combination of both indoor and outdoor spaces. The venue is the biggest project yet by Jonnie and Mark Houston, twin brothers behind some of the top nightlife hotspots in Los Angeles. Early renderings show On the Record will live up to its name, one way or another, with music on old-school vinyl. December 31, 2018, will be the grand opening with On The Record hosting an epic New Year’s Eve party. 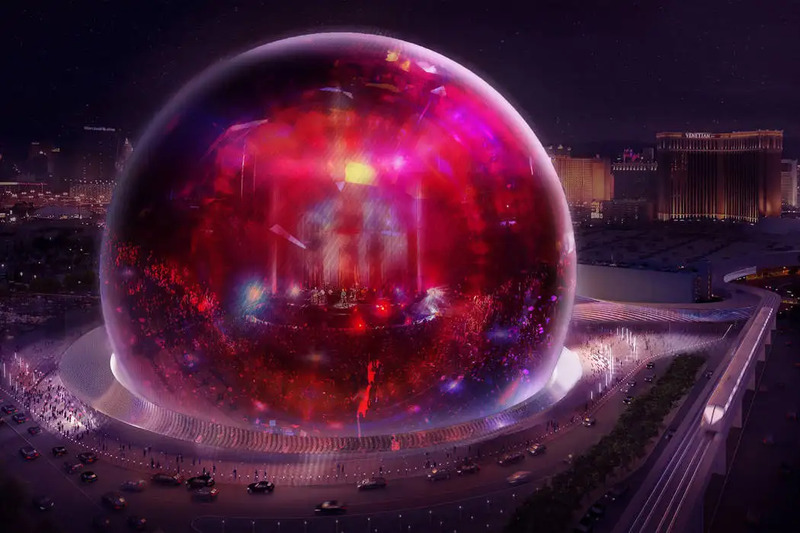 The company who runs New York’s Madison Square Garden unveiled their new design for a 500-foot-wide, 360-foot-tall spherical concert arena. Billed by its investors as an interactive, immersive concert experience, the arena plans to move concerts into the twenty-first century. They promise internet access at each seat and will beam audio directly to each seat rather than using masses of speakers. MSG will break ground on MSG Sphere in late 2018. It will be built near the Venetian and the Wynn, with pedestrian bridges to the former. Chart-topping pop sensation Lady Gaga starts her 74-show, two-year Las Vegas residency in December 2018. Shows will be at the 5,300-seat MGM Park Theater. Like Britney Spears and Jennifer Lopez, even at premium prices fans should expect her shows to sell out quickly. For ticket prices and exact dates, check back regularly. Those who seek an adrenaline rush during their nights out are in luck! Fly LINQ, recently announced by Caesars Entertainment, will be the Las Vegas Strip’s very first zip line. The ride will give 10 riders the chance to simultaneously fly 1,080 feet over The LINQ Promenade in either a flat or seated position. With a growing demand for short, adventurous attractions, this experience is bound to reel in guests of all ages and give them a new perspective on Las Vegas. The Palms Casino Resort continues its massive revamp. 2018 additions include the Camden Cocktail Lounge and a boutique nightclub called Apex. Fresh venues mark the beginning of a $485 million effort to bring back the former love and appreciation for Palms Hotel. Clique Hospitality will do these latest renovations. Camden lounge will move into space on the casino floor that previously housed Social. Apex will takeover Ghostbar’s former location on the 55th floor. What was formerly the Monte Carlo is transforming into a luxurious new resort dubbed the Park MGM. This revamp offers a high-class experience right across from The Park and in between T-Mobile Arena and Park Theater. The new lobby’s magnificent design and the elegance of restaurants like Primrose are only two of the most alluring details. With all that plus new rooms to curl up in at the end of the day, this property is bound to become a favorite.